Editors' Picks: 20 of the Best Things to Do in Virginia! The saying goes, "Virginia is for lovers." And it is. Virginia is for lovers of history. Lovers of the outdoors. Lovers of great music. Lovers of…well, pretty much anything you can think of! The first English settlers stepped foot in the New World on the shores of Virginia. It played a key role in the Revolution, and during the Civil War, when Richmond served as the capitol of the Confederacy - and there are many historic reminders of those earlier days to explore. It was home to presidents, including Washington and Jefferson, whose mansions are still around to enjoy. 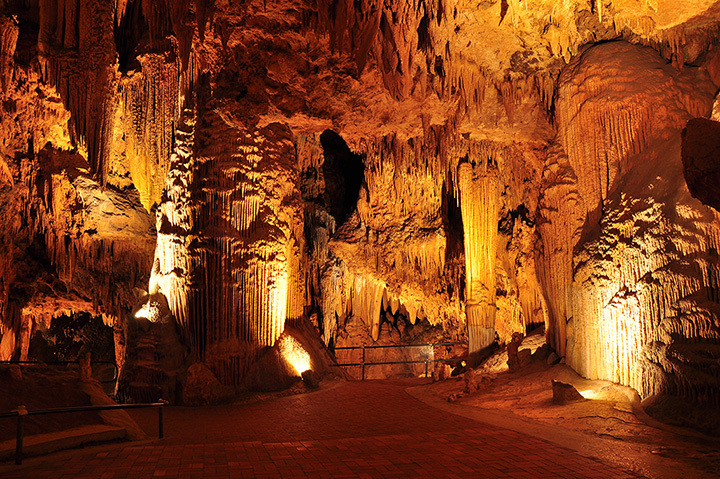 Virginia features incredible natural beauty, as well - from the majestic Appalachian Mountains to the Chesapeake Bay to the cool underground rooms of Luray Caverns. You can visit a Civil War battlefield in the morning, then cap off the day at a winery or art gallery. There are just too many choices - so to give you a jumping off point, here's our list of 20 of the coolest things to do in the Old Dominion. Lewis Ginter Botanical Gardens in Henrico is rated one of the 10 best public gardens in the country. Spread over 50 acres, there are dozens of themed gardens, fountains, a lake and conservatory. What a way to welcome spring! Thomas Jefferson designed this home in Charlottesville, making improvements and changes over 40 years. Inside the house are many of this ingenious man's inventions, writings and original furnishings. The gardens - a particular passion of Jefferson's - are also magnificent. As long as you're doing presidential homes, pay a visit to the residence of our first president, George Washington. The mansion provides an authentic look at life in the 18th century, and the outbuildings offer demonstrations of the various trades practiced during George's day. Finally, pay your respects at the tomb on the grounds where both George and Martha are laid to rest. Before there was Colonial Williamsburg, there was Jamestown, the first permanent English settlement in America. It remains an ongoing archeological site, but it also features recreations of the fort that protected the settlers, even the ships that brought them here. For almost 100 years, Williamsburg was the capitol of Virginia. This living history town and museum lets you step back into a time when the seeds of revolution were being planted. Oh, and it's fun to get your picture taken in the stocks! Manassas was the site of not one, but two, key battles of the Civil War, the First and Second Battles of Bull Run (1861 and 1862). The Manassas National Battlefield does a fantastic job of illustrating the role those clashes played in extending the war for years. It's one of the most popular beach towns anywhere on the East Coast. Besides the actual beach, there's a three-mile boardwalk, an aquarium, fishing pier and more. Since their discovery in 1878, tourists have flocked to these majestic underground caverns to see incredible rock formations, including the Great Stalacpipe Organ. It actually makes music when the stalactites are tapped. And on a hot summer day, the caverns are always cool. This annual July tradition was first made famous in the kid's book, Misty of Chincoteague. Every summer, Saltwater Cowboys round up the wild ponies from nearby Assateague Island and have them swim to Chincoteague. Some of the foals are then auctioned off as a way to control the population. It's really something to see. The Carter Family is American musical treasure, who've been performing bluegrass music since the 1920s. Every year, the Carter Family Fold Festival celebrates this great form of music, with some of the best performers of the genre in the Appalachians. With its history (especially linked to the Civil War), Fredericksburg also touts itself as one of America's most haunted cities. Do some ghost-hunting either via horse-drawn ghost tour, or a walking tour around this ultra-spooky town. Thomas Jefferson had a vision for American wine - and this trail of 22 vintners that winds throughout the state honors that dream. George Washington surveyed it, Thomas Jefferson once owned the land it stood on. This towering rock formation stands at 215 feet high and spans 90 feet, and is one of the country's oldest tourist attractions. You can hike along hit for great views. It's one of the most moving places anywhere in America. Established after the Civil War, on property owned by defeated Confederate General Robert E. Lee, the 624 acres are the final resting place for military personnel from all wars. There are many solemn memorials, including ones dedicated to the crew of the space shuttle Challenger, the Tomb of the Unknown Soldier, and of course, the grave of President John F. Kennndy. There's no better way to savor the fall foliage than on a meandering drive through the Blue Ridge Mountains. The Drive runs about 105 miles - but it may take you longer than usual to get where you're going, since 75 different scenic overlooks will tempt you to pull over for another photo op. Richmond was the capitol of the Confederacy, and this museum is an absolute treasure-trove of artifacts and information about that period in our nation's history. Plus, a separate tour takes you around the former Executive Mansion. December through March is peak migration time for humpback whales in the area. Bundle up and head out on a whale-watching tour to watch these magnificent creatures. Spend a winter's day exploring an amazing variety of works, from ancient Egyptian artifacts to historic photos to unique glass works. There are also daily demonstrations in the Glass Studio. When there's enough snow on the ground, sections of the Blue Ridge Parkway are opened to cross-country skiing. In Virginia, Milepost 12-14 of Reed's Gap is the place to go. The quiet winter months are an excellent time to explore this National Historic Landmark (the Jamestown colonists first set foot here in 1607) in the Virginia Beach area. But the real attractions are the turtles, swans, ospreys and bald eagles enjoying the nearby marshes.